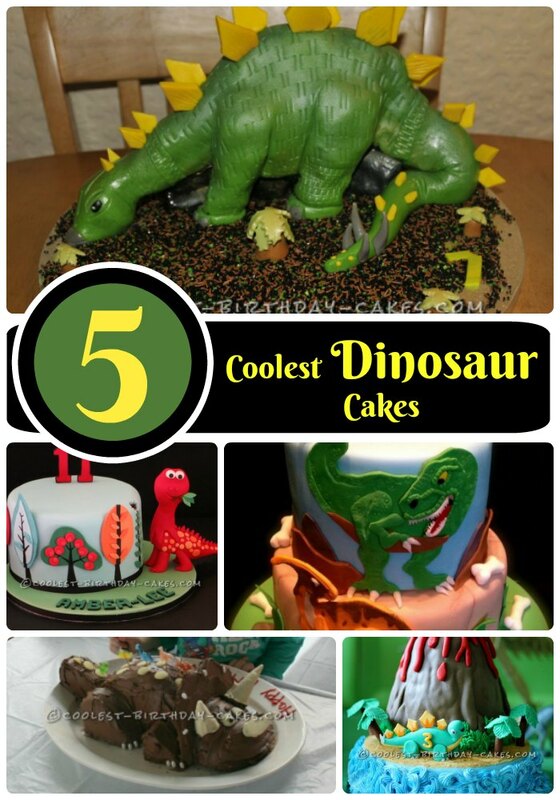 Like so many three year olds, my son HAD to have a dinosaur cake and stegosauruses were his favorite. His favorite color is green thus we have the green stegosaurus. For the body, I baked a chocolate cake in 3 round pans, let them cool, then cut them in half (into half rounds). I stood them up on their straight sides and put them together and held them together with a long skewer all the way through. I stored the cake in the freezer to work on the horns. 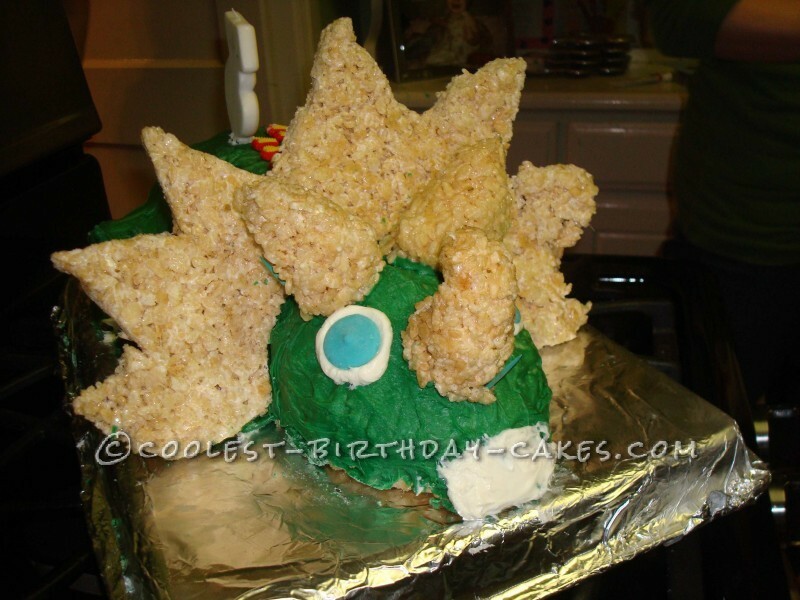 The horns and frill were made by sculpting warm rice crispie treats into the correct shape. Boy, this sounds much easier than it actually was. The mix has to be firm enough to shape, but not too firm to be dry or it will crumble. If it is too wet, it will fall apart or not hold up. My boys loved my mistakes! The head was a chocolate cake baked in a stainless steel mixing bowl then inverted. Once cooled and then chilled in the fridge, I carved the “nose”. Okay, so I don’t know how to use fondant and I don’t really like the taste. I’ve been successful with cake pops in the past so I thought I could use melted Wilton candy melts and spread them so the “icing” would look like smooth fondant. It didn’t turn out that way, but I’m not too disappointed with the result and the crunchiness added a GREAT texture to it. The eyes are icing and unmelted candy melts, the nose is also icing. Now the hard part (I’m certainly NOT a professional) was to assemble the dino and not have anything crack or come apart. Again, I had to use toothpicks and skewers to hold everything together. 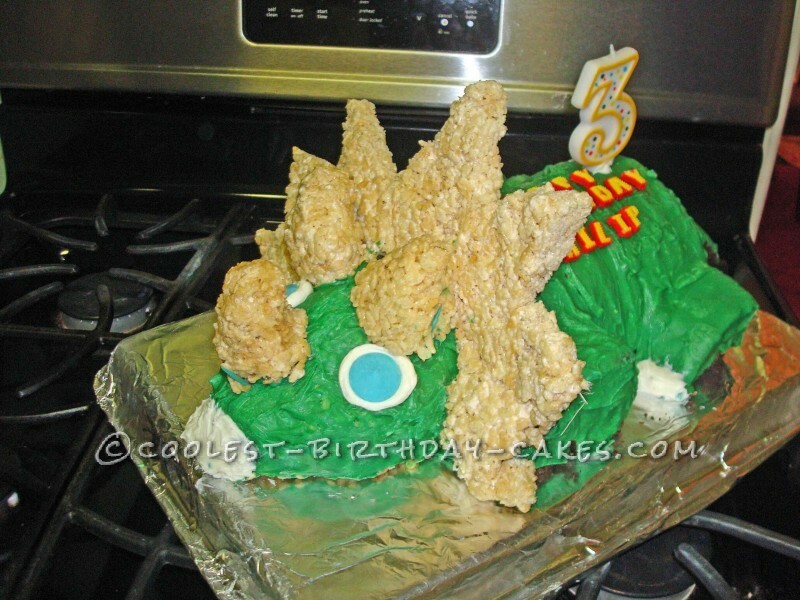 My son and his two older brothers along with the party goers loved it, and they’ve asked for “crunchy” cake ever since! Birthday cake idea posted by Ami F.